Every day, across the world billions of litres of water, milk, juice and other liquid foods are consumed. 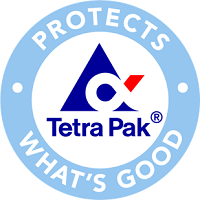 At Tetra Pak, we have developed a range of packages to protect both the nutritional value and the taste of the products inside. Thanks to Tetra Pak technology, the packaging and distribution of liquid products to the consumer has been greatly facilitated. Today, Tetra Pak offers much more than just packaging equipment for liquid food products. We also provide a range of processing and packaging technologies for use with a broad array of products, from ice cream and cheese to fruit, vegetables and pet food. We supply complete systems for processing, packaging and distribution, designed to optimise the use of resources. Our processing systems are not only developed to treat the products gently, but also to minimise the use of raw materials and energy during manufacture and subsequent distribution. We are committed to reducing the environmental impact of our operations and to enhancing the environmental performance of our products and solutions, including the continued development of environmentally efficient packages that protect food and prevent it from being wasted.